Losing a child changes you. It’s changed me certainly, and my thoughts and opinions about ‘what matters’. The solar eclipse wasn’t something I’d bothered to get excited about (it’s hard to be excited about anything these days), but I was surprised about how that opinion was turned around. However, when yesterday, the day before the eclipse, my daughter came home from school and told me that her teacher would be keeping her class inside for an extra five minutes so that no one looked at the sun (and potentially damaged their eyes), I felt a knot of irritation rise up in me. This event (which in my eyes was a bit of a reminder from the heavens about just how amazing the universe is) is one of those one-offs that is unlikely to occur in my lifetime again, or even my children’s (though don’t even get me started on what I now term a ‘lifetime’; living to old age is something I don’t take for granted anymore, for anyone!). My daughter asked if she could stay home to watch the eclipse or at least to experience it, as she’d be trapped in a stuffy classroom with no view. It was due to happen between 8.30am and 9.30am, and I thought, why not! I agreed that, if the sky was clear in the morning, both my daughter and son could stay off school to watch/experience the eclipse and I’ll take them in straight after. 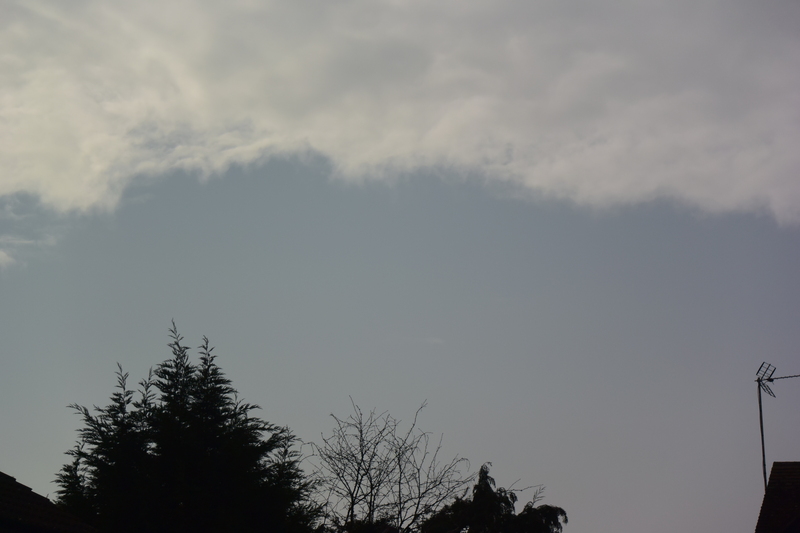 I must admit I was kind of expecting a cloudy start so it’d be a fuss about nothing, but no, the sky was beautifully clear first thing and the sun was shining away. We all got ready and my daughter began to have doubts: ‘what if I get into trouble for not going in?’, ‘will they believe me?’, ‘will it be awkward going late into lesson?’. So then I began to waver too (being decisive in grief is near impossible, I’ve known myself to deliberate far too long over even simple decisions like whether to have jam or marmalade!). I could see other families and people going about their daily routine. Other than a rather excited Brian Cox and some weather women scattered about the country, people around me seemed to be unfazed by all the hype. My son decided he wanted to get to school on time. 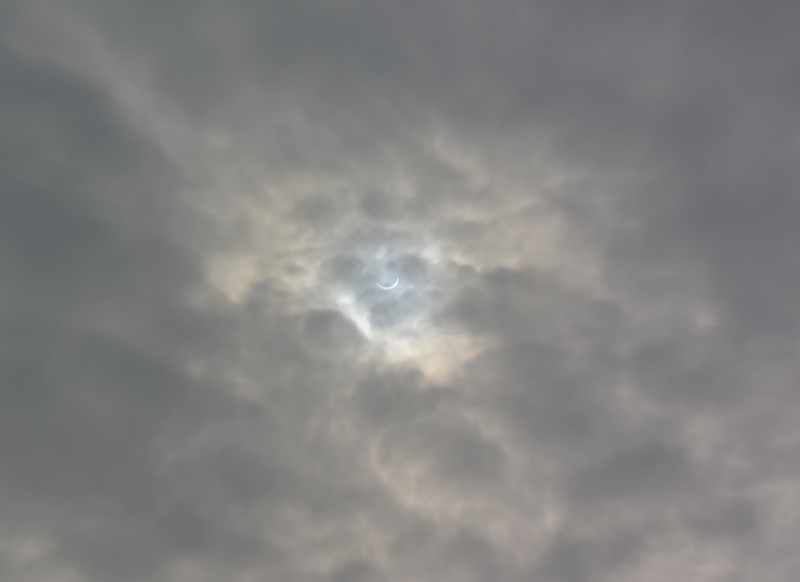 By 8.50am, the eclipse wasn’t really visible and was taking its time, he wanted to be at school. So I took him and came back to my daughter. She was scrolling on her phone, clearly getting bored by the ‘non-event’, so I told her to put it away and watch the facts that the people on TV were telling us about what we were seeing. He did some useful demonstrations about how the eclipse occurs and why in a million years from now we won’t have eclipses anymore as the moon will move further away from us (strange thought!). We also discovered we could use a colander to view the sun safely, so we grabbed one and went into the garden. Again, not much happened for a while but then a patch of very light cloud came over the sun and the sky seemed to go dusky. The birds all went a bit crazy and flew back to the trees. Everything felt very still and peaceful. 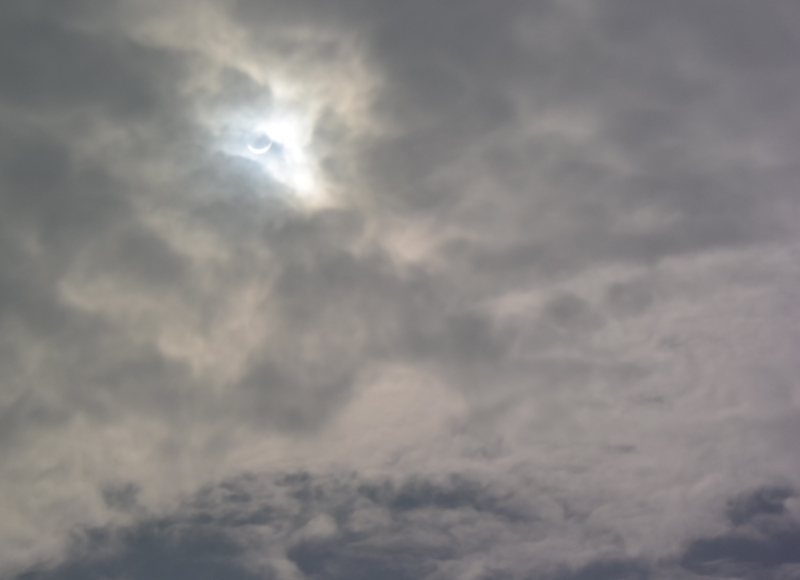 We were able to take photos of the eclipse and could view it through the images on our screens, and with the cloud over the sun it was easier to look at (although we were very careful!). Our pictures weren’t amazing as we were totally unprepared but I think we managed to capture the moment well enough. As soon as we’d got a few pictures and the eclipse started passing over, I took my daughter up to school with a note to explain why she was late. She was a bit self-conscious, after all, it’s not a usual reason to get out of class, but then I wasn’t about to make up something just because the school couldn’t be bothered to use this event as a way to educate all the children on the wonders of our solar system. I vaguely recall the last eclipse, in 1999. I had just got married and my husband remembers going up the hill to watch it, along with a number of other people, all with special specs in hand. I didn’t go. I can’t even remember why. I was probably working. I probably thought ‘what a load of fuss and nonsense, I’ve got deadlines’. I hope that in years to come my daughter will remember the morning she went in late to watch the eclipse with her mum and baby brother in the garden. It’s not the most amazing life-changing moment, but it’s far more memorable than being sat in a dark IT classroom pressing buttons on a keyboard.